Source: North American Athleticwear, Inc. 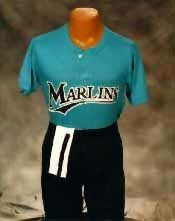 This company offers baseball and softball uniforms in 16 standard colors. Uniform pants are made of double-knit polyester and feature a four-needle elastic waistband with adjustable drawstring, reinforced knees, and a patch pocket on the right rear of the pants. Shirts are made of dazzle cloth with a pro-style contrasting trim on the neck and sleeves. Sleeveless tops available are for girls. Socks are made of 80% orlon and 20% rayon and feature a padded foot and heel, as well as a contrasting knitted-in stirrup. The uniforms are available in two youth sizes (S, L) and five adult sizes (S, M, L, XL, XXL). The manufacturer offers full service scanning and computer design capability to develop a consumer's logo. In addition, they have a full service screen printing and numbering company to deliver uniforms complete. North American Athleticwear, Inc., 112 Business Park Drive, Indian Trail, NC 28079. Tel: 704-821-0555. Fax: 704-821-0789.